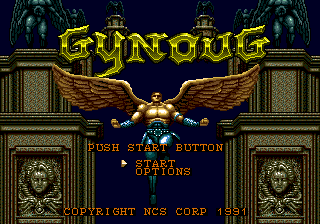 Gynoug (ジノーグ), called Wings of Wor in the US, is a shoot-'em-up developed by NCS in 1991 for the Sega Mega Drive. It was published by Masaya in Japan and Europe and DreamWorks in the US. You play as Wor, a winged warrior who has to drive the evils of Iccus, who are attacking the heavens, back to their home and destroy them. Gynoug is split into five rounds, each with a mid-boss and an end boss, plus a final "boss rush" round. There are three different normal shots ( fires) and you have rapidfire. You can collect a series of magic spells (six offensive and two defensive). Cycle through them with and use them with ; once you use a spell, it is gone. Instead of following the typical powerup system, Gynoug uses a string of orbs to represent power level: collecting red and blue orbs will add one to a meter of the appropriate color in the HUD (and will consequently power up your weapons); losing a life takes one away from each. There's also an item to increase your movement speed, which is reset upon death. In the last round you must face powered up versions of previous bosses, before facing the last one. Note: The Japanese version credits the programmer as "Halloween" Moriyah and one of the graphic designers is called Hisami Takizawa instead of Hisako Takizawa.